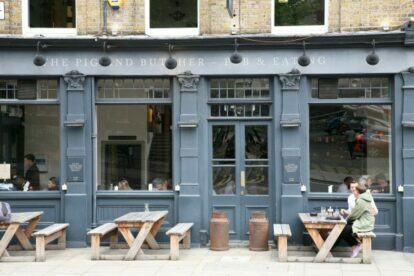 We may be living in the age of the gastropub, but even those weary of the trend should give the Pig & Butcher a whirl. I won’t suggest what to order, as they’re unlikely to have it: the menu here changes daily, dancing in perfect step with the season. The meat is butchered and, where applicable, cured and smoked on-site (the name is no coincidence, then), with a focus on more unusual breeds. Game also makes a frequent appearance, while each day’s fish options depend entirely on the morning’s catch. There’s an imaginative wine list and a delicious selection of craft beers and cocktails to wash it all down with. All of which may raise the question of whether this is really a pub at all, but the genre is valiantly defended by matter-of-fact tables of untreated wood set beside gaping windows, an ample seating area for outdoor supping and unpretentious service dispensed by amiable bar staff. Genuinely outstanding grub with no attitude – gastropubs like this one are few and far between. Please note that the opening times indicated below are for the pub; for serving times for food, please see the website.